UNITED NATIONS, December 29 -- Five days after a $5.153 billion two-year budget was adopted by the UN General Assembly, the US Mission to the UN on December 29 put out a "fact sheet" declaring that "when factoring in the difference between the likely budget level based on historic patterns and the budget approved last week, this budget represents a savings to American taxpayers of as much as $100 million." Even this inflated savings figure, however, is entirely offset by $100 million that had been due to the US Treasury from the UN, but that the UN was stealthly allowed to keep early this year, the so-called "Tax Equalization Fund." Click here for that story. "copies of any and all letters or emails or other records between or among Under-Secretary of State Patrick Kennedy and/or his subordinates and United Nations Secretary-General Ban Ki Moon and/or his subordinates concerning balances due to the United States from the Tax Equalization Fund, including the request by the UN (and the subsequent concurrence by the Department of State) for the so-called 'repurposing' of US-owned Tax Equalization Fund credits for security purposes, including as related to the UN Capital Master Plan. I am covering this TEF issues at the UN, asked Ambassador Rice about it this week - this is for news gathering purposes and is entitled to fee waiver, as receive from Federal Reserve and other gov't agencies." Despite US Ambassador for Management and Reform Joe Torsella's repeated statements about transparency, and contrary to the time lines applicable to FOIA, ten and a half months later the State Department has yet to provide a single documents responsive to the FOIA request they acknowledged receiving on February 11, 2011. Torsella at the Fifth Committee's first meeting on the budget spoke eloquently and even live tweeted about making the process visible to taxpayers around the world. But in the final 20 hours of the budget process, when deals were cut and votes taken, Torsella stopped any tweeting, and has not responded to tweeted questions since. 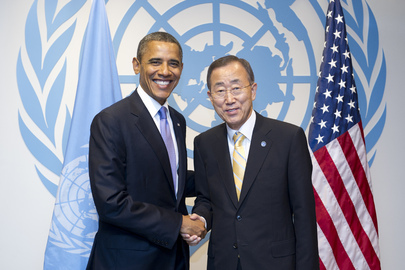 Rather than being described by him or the US Mission, Torsella's backroom moves, such as at the eleventh hour proposing increased flexibility for Secretary General Ban Ki-moon whom a number of budget committee diplomats referred to as a "tool of the US" on this issue, were only made public by other delegations. Beyond the one page "deal sheet" which a non-US delegation provided to Inner City Press on the evening of December 23, Inner City Press has now exclusively obtained a copy of a spreadsheet from the UN budget negotiations, reflecting that the US was not the one proposing the largest cuts. We will have more on this -- watch this site. Footnote: Ban Ki-moon has, as an echo, made similar claims about cost savings and doing more with less -- while for example his Spokesperson's Office on December 29 declined to answer simple questions about violence in Egypt, Turkey and Sudan, where the UN spends more than $1 billion a year, click here for that story.